Planning is integral within all aspects of your wedding and this is no different when it comes to your shoes. However as with these other aspects, to plan your shoes, you need to think about your wedding as a large painting made up of lots of little brush strokes combining to create your overall desired effect. Creating mood-boards of your wedding ideas or schemes can really help you to see this bigger picture and show you how to amalgamate it all together. This can be explored in a combination of different ways from cutting out images from your favourite magazines, and not just the bridal ones, to using online tools like Pinterest, which can allow your bridesmaids to help you plan too. These mood boards allow you to explore the little details that would like in your wedding and how you could combine them with your footwear. 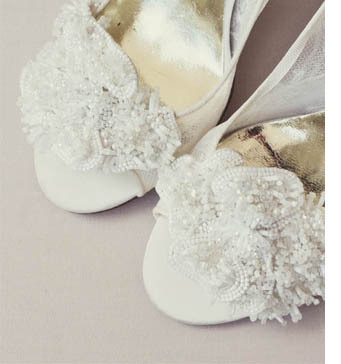 From gold roses that compliment your bouquet and colour scheme to ornate jewels that could be family heirlooms the possibility for your shoes are virtually endless. Your shoes should be combined with your accessory planning, as making these items work together as a group, and with the dress, is crucial. If you were going to be wearing gold jewellery and warm accent colours then you would want to mimic these in your shoes. Some designers can offer a variety of colours in each style so this is defiantly something to consider when planning your accessories and shoes. Designers and photographers will often use the rule of thirds to create designs that are appealing to the eye. This is a guideline, which proposes that when an image or design is thought about in thirds and is aligned in such a way the rule creates more energy and interest than thinking purely central and linear. You can use this rule when planning your accessories by thinking about them in sets of three, for example: headpiece, bracelet and shoe adornments. Keeping to this simple rule of three can help you to add the detailing that you are looking for within your accessories and shoes, without adding too much. Taking into consideration the other two pieces and your dress is key to purchasing the perfect pair of shoes for your wedding day. That is why we feel planning makes perfect.